I am popping in quick to show you a neat picture...ok not neat, but one that has me excited. I know...omg Di is showing her face...she should have put a warning!!! For years and years...and years I used Oil of Olay every day and no foundation, but I did use eyeliner and mascara. I have never been much of a makeup girl cause I want the natural look and just like my hair I want to wash and go...but once I turned 50 (3 years ago) the Oil of Olay did not seem to cut it anymore and I have been getting bags under my eyes, wrinkles and age spots...good grief. So a few of my friends told me to try Ever Skin products and I thought what the heck I will sign up and save myself some money and see how it goes, and I love it, I could see a difference in just a few days. I still have a ways to go, but I love that my skin is healthier and it is not that hard to do. Too funny, the mascara is the big wow, it makes my lashes so long and it lasts all day. I have even been using eye shadow and blush and it just looks healthy not like I will be standing on the street corner. I know that is bad but you know what I mean right? You can see in the pics above I showed the lashes with the mascara on the 21st, I should have taken one with no mascara. But anyway you can see the difference in the bags a few days later. So that has me excited. I can't tell you how many times I went into Ulta and each time they sold me something different and nothing worked. I have a drawer of junk. So if you have any questions just holler. I have an online store here. Definitely check out the Mascara, (I love it works without all the fibers that make a mess) and the Revive and the Sublime, I also love the Hydralift and the Rebalance. I love the subscription part so stuff ships automatically, it saves you money and you can earn free shipping no more running out of stuff. Oh and Ulta...I only shop there for nail polish now...ha! Oh and this is totally a side gig, if anyone wants to place an order and try it out, I totally appreciate it. But Stampin' Up! is still my baby and my full time business...although it has taken a bit of a backseat while we figure Jeff 's health out (he goes for his cardioversion tomorrow - I have been praying that we get there and they say, it's all back to normal, just go home) I will be a Stampin' Up! Demonstrator for years and years from now. Heck I am going on 19 years, can you believe that? Time sure flies when you are having fun. So I will sign off for now, gotta go pack a bag in case they admit Jeff to the hospital (I told him if we take it we won't need it). I just wanted to come in and let you know what was up if you had seen my posts on FaceBook. Thanks to all the many comments and prayers. We love you all. 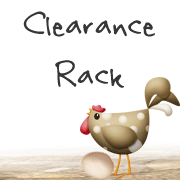 Clearance Rack is Updated - Shop While Supplies Last! !